The semis have been on fire in 2019, and the group shows no sign of fatigue. The SMH rose 1.2% this week, good follow through after the previous week screamed upward by 5.8%. This group along with software has a profound influence on the Nasdaq, which by the way paused at the very round 8000 number Friday registering a doji candle. Below is the ratio chart comparing the SMH to the IGV, and it displays how it has dominated against the sub sector. On a YTD basis the SMH has gained 30.5%, and the IGV 24%. Obviously software has been no absolute laggard, but keep in mind the SMH pays a dividend of 1.44%, and the IGV sports an infinitesimal dividend of .04%. 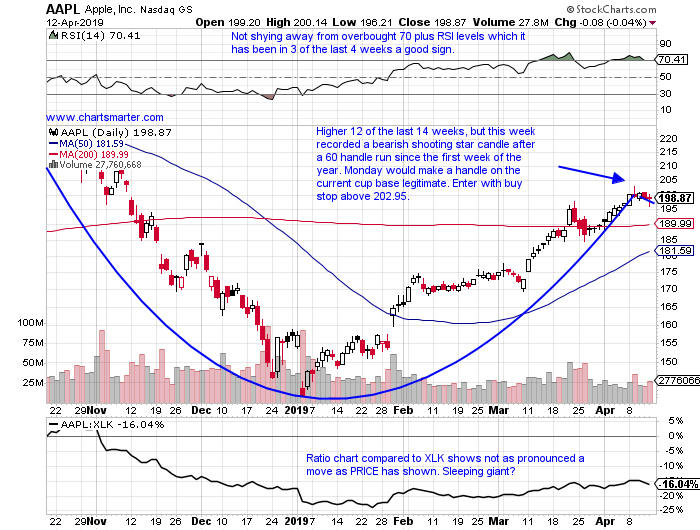 We frequently mention that gauging AAPL is a good way to feel out investors risk tolerance. It is a proxy not just for the Nasdaq, it makes up 6.5% of the tech index, but the overall markets. Three weeks ago, we declared that the 200 day SMA resistance it was encountering would be a good sign for the direction of the major benchmarks. A decisive move through it, upward, would signal investors willing to take a more offensive approach. That conquered and fast forward too today, now the very round 200 number should be a big test. 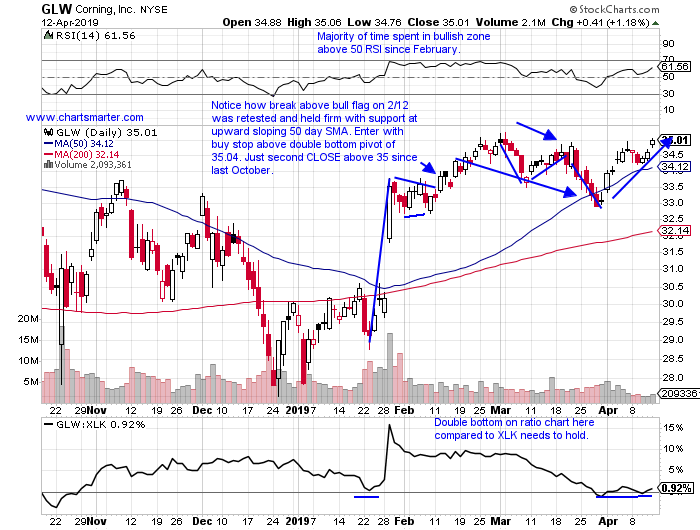 This week it traded above 200 intraday every day, but recorded just two CLOSES above. 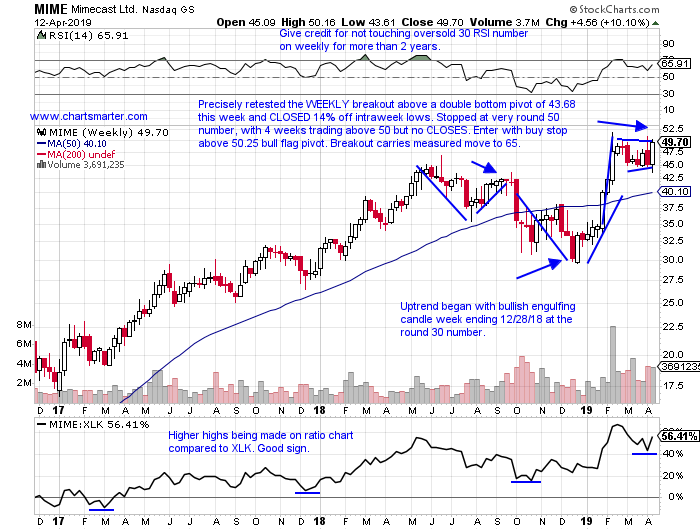 It CLOSED 2% off intraweek highs, and in the lower half of the weekly range. New issues have dominated the headlines as of late with Uber announcing its own plans to come public this week. LEVI reported this week and did not participate in Fridays firm tape. LYFT fell 19.5% this week and is now 32% off most recent aftermarket highs. Below is the chart of a software name, a top performing subsector in tech, and how it appeared in our 4/8 Technology Report. 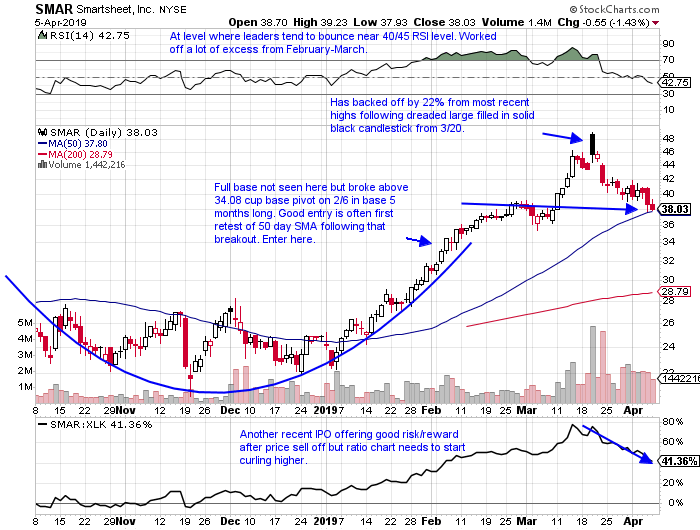 The stock tested its rising 50 day SMA after a cup base breakout on 2/6, and that is often a good spot to enter. It is still 18% off most recent 52 week highs, but rose 6.2% this week, CLOSING near the top of its daily range everyday this past week. 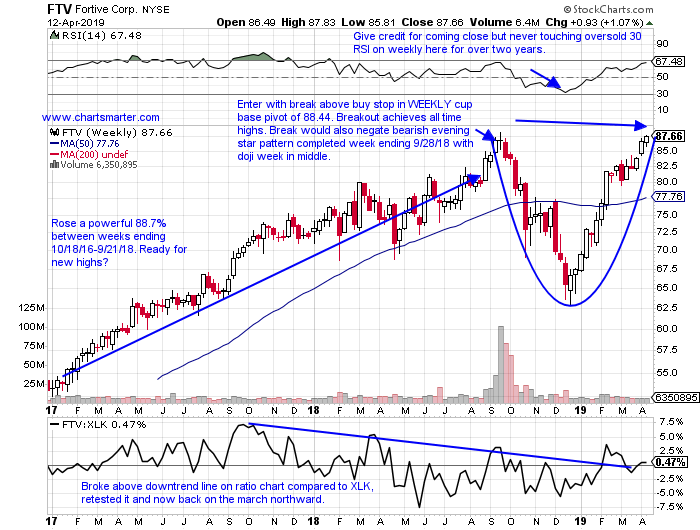 Nearly 3 year old spinoff from DHR and higher by 30% YTD and 17% over last one year period. Dividend yield of .3%. 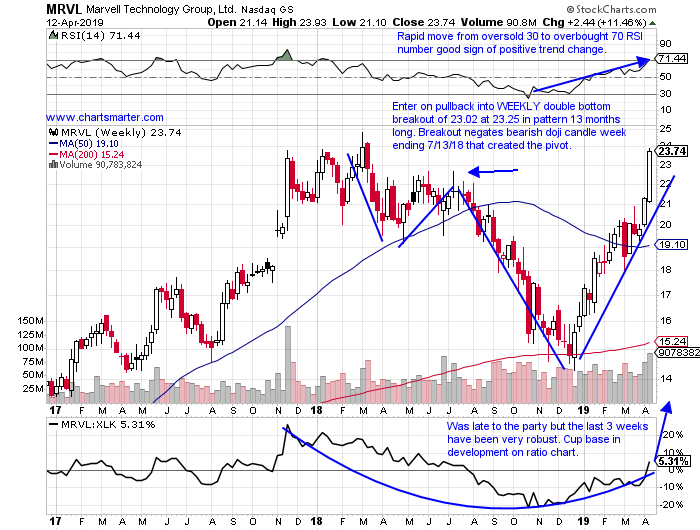 Higher 12 of the last 16 weeks and has gained 39.7% from top to bottom during time span. Last earnings reaction rose 3.2%, ending a streak of three losses of 4.3, 1.7 and 1.3% on 10/26. 7/27 and 4/27. Enter with break above buy stop in WEEKLY cup base pivot of 88.44. Breakout achieves all time highs. Entry FTV 88.44. Stop 85. "Old tech" play higher by 16% YTD and 27% over last one year period. Dividend yield of 2.3%. Up 8 of last 11 weeks and mainly digesting the big weekly gain of 9% week ending 2/1. THREE consecutive positive earnings reactions higher by 11.1, 1.9 and 11.3% on 1/29, 10/23 and 7/25/18. Enter with buy stop above double bottom trigger of 35.04. Entry GLW 35.04. Stop 33.75. (REPORTS 4/30 before open). Electronics play higher by 41% YTD and 49% over last one year period. Advanced 12 of last 14 weeks, and 8 of the 12 up weeks gained better than 3%. FOUR consecutive positive earnings reactions higher by 2.2, 14.5, 13.4 and 10.8% on 2/8, 10/25, 7/25 and 4/27/18. Enter here after break above WEEKLY cup base pivot of 18.42. Add to through round 20 number. Entry KN here. Stop 17.25. (REPORTS 4/25 after close). "Old tech" semi play higher by 47% YTD and 6% over last one year period. Dividend yield of 1%. Higher 11 of the last 16 weeks, and the last 3 alone have advanced by a combined 19.5%. Eight session winning streak and 4/10 and 4/12 both were accompanied by double average daily volume. Enter on pullback into WEEKLY double bottom breakout of 23.02 at 23.25. Pattern was 13 months long. Entry MRVL 23.25. Stop 21. Software leader higher by 48% YTD and 31% over the last one year period. Eight of nine week winning streak weeks ending between 12/28/18-2/15 rose 74.2% top to bottom. 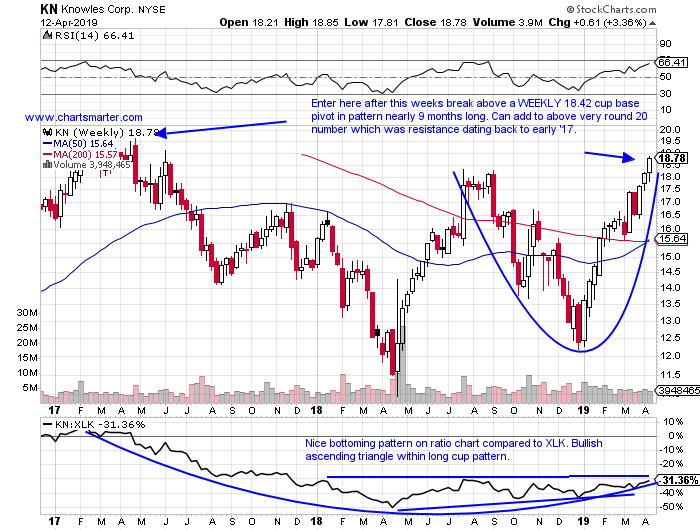 Break above WEEKLY double bottom week ending 2/12 rose 12.3% on best weekly volume ever. Great action POST break. Enter with buy stop above WEEKLY bull flag pivot of 50.25. Break carries measured move to 65. Entry MIME 50.25. Stop 47. Buy stop above WEEKLY cup base pivot FTV 88.44. Stop 85. Buy stop above double bottom GLW 35.04. Stop 33.75. Buy after recent break above WEEKLY cup base pivot KN here. Stop 17.25. Buy pullback into WEEKLY double bottom breakout MRVL 23.25. Stop 21. Buy stop above WEEKLY bull flag MIME 50.25. Stop 47.